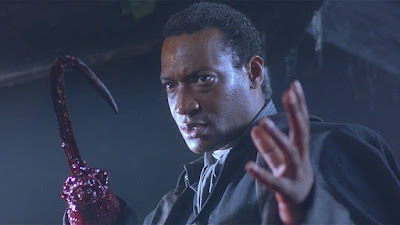 One of you must've said his name five times because the Candyman is here. A few months ago we learned Jordan Peele may be developing a reboot of the Candyman horror franchise, and now we know exactly how he'll be involved and who will get behind the camera. Peele will produce and co-write Candyman along with Win Rosenfeld. The movie is actually untitled at this point and is being described as a "spiritual successor", so who knows how similar it will be to the original which centered on the titular urban legend, the brutally-murdered son of a slave who can be summoned by saying his name five times. On board to direct is Nia DaCosta, a rising star who made a splash at Tribeca earlier this year with Little Woods, a crime thriller starring Tessa Thompson and Lily James.